Michelle Davies | The Journal Gazette IPFW’s Max Landis attempts to drive under the basket against Oral Roberts’ Denell Henderson in the first half of Saturday’s game at the Gates Sports Center. Landis led the Mastodons with a career-high 27 points. Michelle Davies | The Journal Gazette IPFW’s Isaiah McCray powers through Oral Roberts’ defense during the first half Saturday. IPFW junior Joe Reed has had a different perspective the past few weeks as he has transitioned from a role as a starter to coming off the bench. Like everyone else with the Mastodons’ program, he’s loved everything he’s seen. IPFW, which went through a 23-day stretch last month in which it won just one of seven games, earned its fifth straight victory Saturday night with a 75-69 decision over Oral Roberts before announced crowd of 1,068 at the Gates Sports Center. Junior Max Landis, who replaced Reed in the starting lineup five games ago, led the Mastodons with a career-high 27 points. 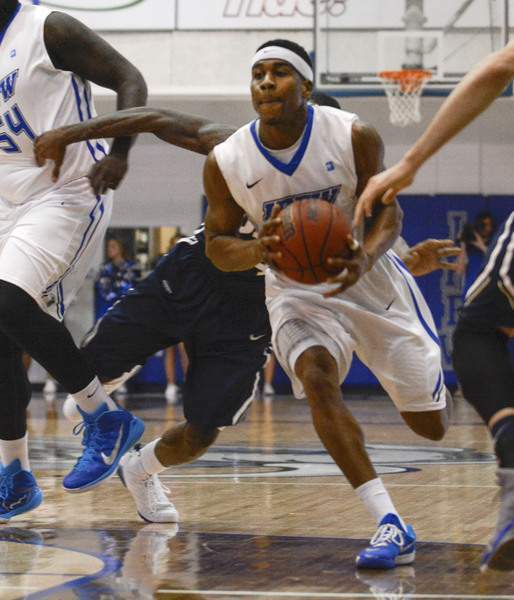 And Reed, who played 31 minutes off the bench, contributed to the Mastodons’ resurgence with 12 points. "I think it’s just been our aggressiveness, our toughness," said Reed, a starter for the first 17 games of the season. "We were getting sick and tired of losing. We’re not used to it, it’s not something we do in this program and we don’t want people to (think) that’s how we are. "We got together as a team and said we were going to be a lot tougher, we were going to fight more. These last five games it’s been a different team than what we’ve shown." The Mastodons improved to 13-11 overall and 6-5 in the Summit League. 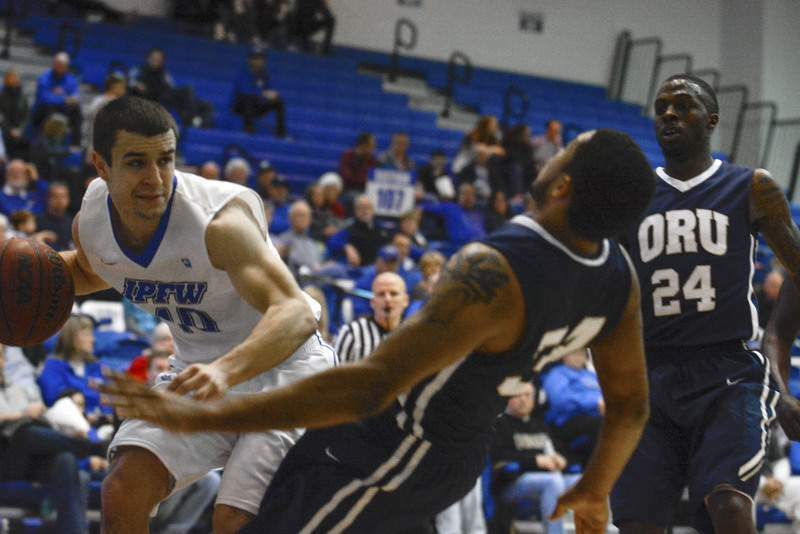 "I’m really excited for our guys because this is a well-deserved run that they’ve had," IPFW coach Jon Coffman said. "They’ve been battling all year and the last five games the toughness our guys have displayed is unbelievable." Three weeks ago, Oral Roberts (13-11, 6-4) outtoughed IPFW in a 62-58 victory, and things were trending that way in Saturday’s rematch. The Golden Eagles, who trailed by 11 in the first half, held the lead just once all night at 43-40 with 14:29 remaining. The Mastodons were showing signs of cracking, with two turnovers against the Eagles’ press. This time, it was just a momentary lapse. "They’ve always had it in them," Coffman said. "Our team, I believe, is playing harder right now. We could not have defended the Oral Roberts team like we did tonight in man-to-man defense three weeks ago. We didn’t have that in us." Reed, Joe Edwards, and Landis all scored inside its next three possessions to give IPFW the lead for good. And then Steve Forbes took over. Forbes, the Summit League player of the week, was in foul trouble much of the night. But he had nine of his 13 points during a 3:19 stretch to spark a 12-2 run and put the Mastodons up 62-51 with 6:35 to go. "Every time he was in we used him," Coffman said of Forbes. "He does so much for this team when he’s posting hard and trying to dominate in the post. Right there he got some critical buckets." Korey Billbury, who led Oral Roberts with 19, hit a 3-pointer with 3:02 left to cut the lead to 64-62, but Edwards and Forbes each scored and Landis hit 5-of-6 free throws and added a last-second layup to keep the Eagles from getting any closer. Since being inserted into the starting lineup, Landis has averaged 15.8 points, and scored 46 the past two wins. "Max is playing out of his mind right now," Forbes said. "He’s been one of the keys. He’s not a real vocal guy, but when he came inside the locker room and said something everybody sat down and listened." IPFW plays its next three on the road, beginning at 7 p.m. Wednesday at IUPUI.